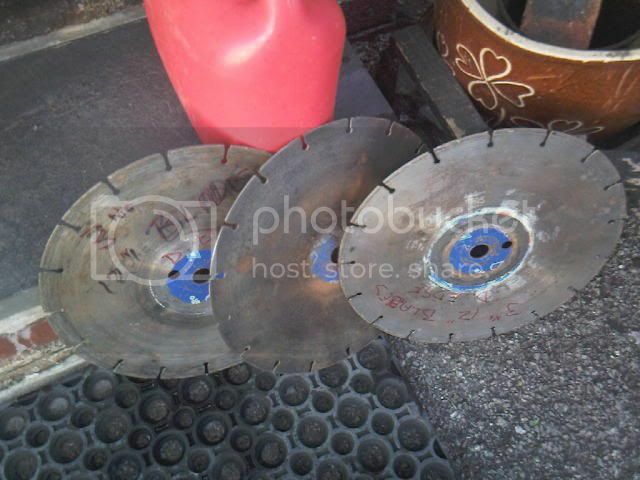 Ive just got my self a cheap petrol disc cutter only £40. I got some diamond discs for £7 for the 3. I had problems with it trying to start it but cleaned it all up tried everything. In the end the mixture was ajusted its starts and runs just needs the final ajustments doing now. 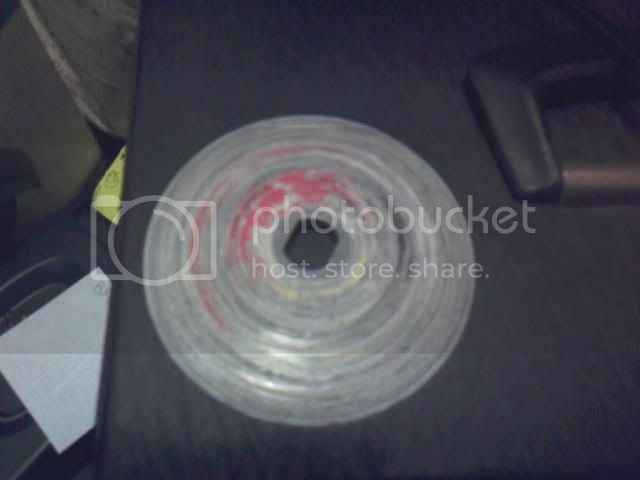 When you put a disc on it lacks power when cutting. But it idle ok and runs ok also plenty of power when not cutting. Im getting a plate made for it cause the outside disc plate missing. But these can be made easy enough and cheap enough. Anyhow Im trying to find out what model and make this is. 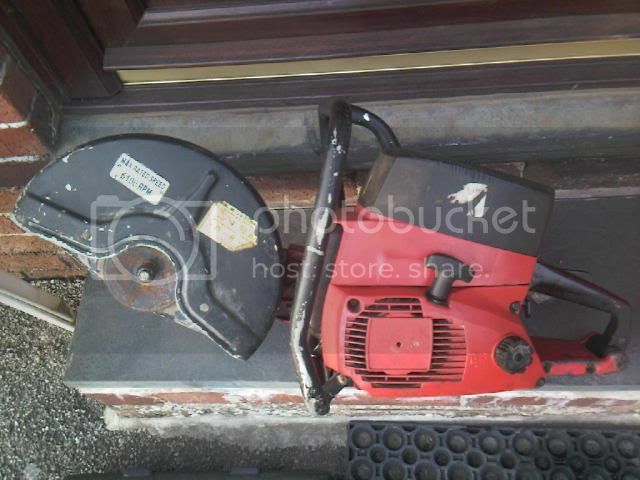 So far I think its a Husqvarna being red. As Ive seen afew red ones on ebay now and then. Here some pictures of mine below. its funny when you take off the brandingt hey nearly all look the same. without the red colour I would have said it was a Partner cutter. I hired a Huslky one just like this one from HSS last week, and sounds like the same heap of shi#e I had, when it finnaly started it would idle grand and then once you started cutting it would falter a few times then die. I ended up throwing it off the pile I was working on. I dont know how the innards work too well but it feels like a compression problem, the high revs just dont transalate into any torque. 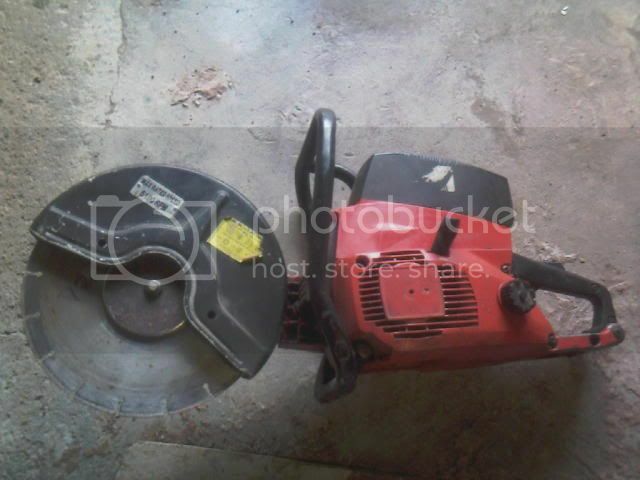 I hired a new stihl 12" cutter from an independednt shop, different class, a beautiful machine. Well this machine ant a rubbish one like you had thats for sure. It wasn't running at all and now its nearly perfect running now. It only needs a fine tune which my mate will do and it will be fine. The compression in this is like new there loads and loads of power and revs to. Also a new spark plug needs fitting in as well that will make a diffrence as well. Huskys aren't red there orange, and they don't build them like that. 1, the disc guard/hood is wrong. 2, the rear handles aren't built like that there integrated into body making them all in one, plus there's no safety cut out switch ontop of the handle. 3, the front handle is completely wrong, even if you look at 80's & 90's models. 4, there's lots of other things i could write but it would just carry onto another page. Whatever that is though, you should check the clutch and the belt. Idleing will always give you lots of power because it's not doing anything. Check the clutch is healthy, it must be for it to spin the disc and the belt must be set right for it to grab the spin of the clutch or it will just slip constantley when power is applied. 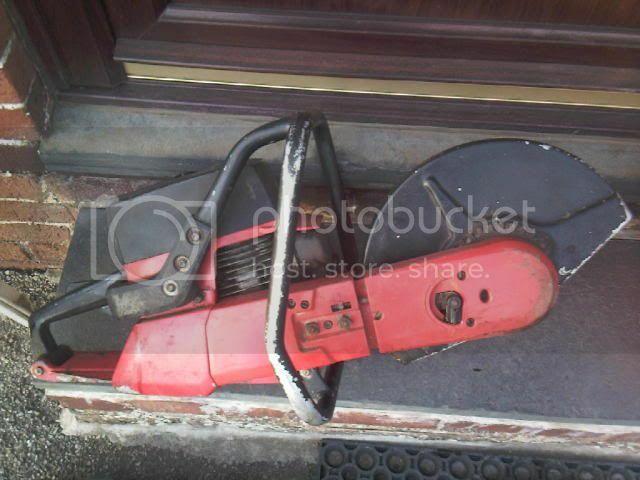 P.S, that actualy looks like an old 90's hilti from the disc guard and the belt cover and the front handle. So far it looks like this is a Sachs Dolmar disc cutter. Ive done alot more research in to this. There afew on ebay about not many now. But Sachs Dolmar took over Mikita. The Sachs name was kept but not used after. The Dolmar and Mikita are both still selling today. So its interesting to find all this out cause there no where in the world online that knows this about this model I have. There very rare to find and get a working one now. They where made in the 1980s sometime. Ive managed to find 1 the same as mine but it was only spares or repair. But there afew 309 Sachs Dolmar on ebay sightly diffrent shape but red to. Ive worked it out from doing research and checking out parts and models Ive seen. I borrowed my mate mikita flange washer disc spacer it fits. So there parts which I can still get no problem which is good news. Sorry but your research took you the wrong way with this machine pete, i knew i'd seen one before and it does look alittle like an old hilti but it is actualy a kango k1000. Hello thanks for the information your correct. Its something Ive been looking for ages now and thought I found it. Its nice to final find what it is. Ive got some updates with the machine to do with some pictures later on today. Any idea when these where made year? Also is kango still around or anther company bought them out? Kango is the industrial side to milwaukee they are also owned by milwaukee and they still make the k1000 machine.